The Interurban Trail’s close proximity to Aurora Avenue and the economic core of Shoreline will provide access to nearby shopping, services and employment, plus access to transit centers at Aurora Village and the Shoreline Park and Ride. The trail project includes rest stops, trailheads, interpretive historical and natural features, and directional signs. 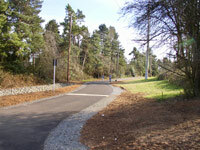 A new signal installed recently at Linden Avenue N and N 145th Street (Seattle/Shoreline city limits) improves trail user safety. This routing is over three miles long, even longer when you take waiting for traffic lights and the fact that there is no relief station (public restrooms). The rest stops are benches. My travels along this trail vary from day to day, from its end at N. 200th coming from the Aurora Village Transit Center when I am coming back from my visits to the VA Hospital, or from near the other end at N. 145th when I am slogging back from work, days and nights. Everyday there is a constant on this trail: those with their backpacks or duffle bags. Most are carrying their belongings up and down this trail, or a few are just sitting and staring. Or, in one case, a man sitting and just knitting a scarf against the cold. The one thing I have noticed here is the lack of youth among the homeless. Along the trail these people are middle-aged and older males. They remain detached and alone. Upon seeing each other, they do not approach one another. And when I say hello, they are suspicious at first. They are much closed mouth, and admittedly are very prideful of themselves. I do not smell alcohol, and do not detect any influence of drugs. I see men that are on their way to who-knows-what or where. A few were just staring into trees. Another was devouring a whole eight piece chicken from a grocery deli. The customers were passing him by, pretending not to notice his bags piled on the chair across from him. This is common pretending. Think about eating your dinner then having to pick up your whole life and carry it into the night. On another day I came across a man who was bundled against the cold. He had his parka hood pulled tight around his head and his head bowed and nodding. As I approached him I was thinking something was wrong and should ask. So I did. He noticed I was in front of him and stopped moving and he looked up with a tear-streaked face. I asked him again if something was wrong, and he pointed to his ears. I realized then that he was deaf. I wrote on a piece of paper if I could help. Did he need something? I offered him my pen. He just stood there for a second. He dried his face. Then he smiled, never said a word, placed his arm through mine and had me walk him to the cross walk. He waved goodbye, and I have yet to see him again. Further on there is a small clearing where at times one can find people laying out swaddled in blankets, sleeping. It is near the transit center’s facilities where there are restrooms within walking distance. The ground I notice is always damp there. This entire wondrous splendor meanders along three scenic miles of shopping, at a cost of $11.3 million dollars. Yet one can not take a pee a long the trail for fear it will draw the homeless undesirables. What impresses me about this post, is your willingness to help someone who appeared to be in need. And you were paid well for that kindness. That trail may have cost $11.3 million, but the smile your recieved was priceless. Wouldn’t it be great world if we all more willing to give one another a smile instead of a glare?